In a small saucepan over medium heat, bring glaze ingredients to a boil. Boil while whisking for 12-13 minutes or until mixture reduces by half. Remove from heat. Set aside to thicken while preparing fish. Coat a rimmed baking sheet with olive oil. Layer sliced grapefruit on baking sheet. Drizzle with olive oil. Lightly coat cod with olive oil, salt and pepper. 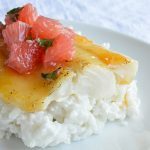 Place fillets on top of grapefruit slices. Slather fillets with glaze. Broil on high 3-4 minutes or until tops are lightly browned. In a medium saute pan, bring coconut milk, salt and rice to a light boil. Reduce heat to medium/low. Cook for 18-20 minutes while stirring frequently. Remove from heat once rice reaches desired tenderness. (Add a splash of water if rice requires additional cooking). Combine all salsa ingredients and refrigerate while preparing fish.